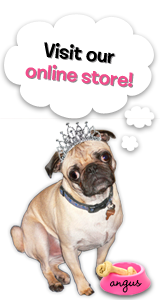 The Rubber Cafe Design Team Blog: Springtime 'Pop'! Hi Everyone! 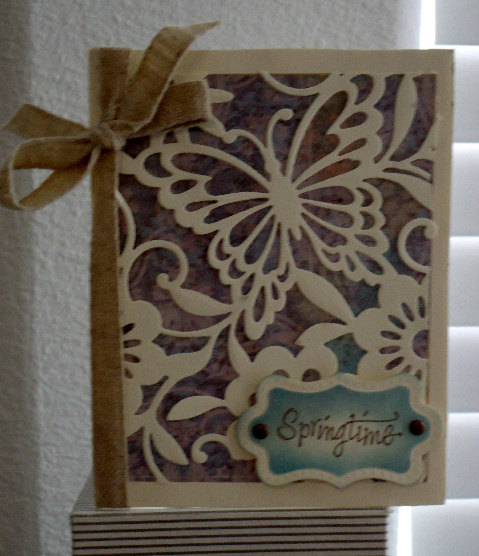 Today I have a fun Spring card -that has a pop-up featured on the inside. 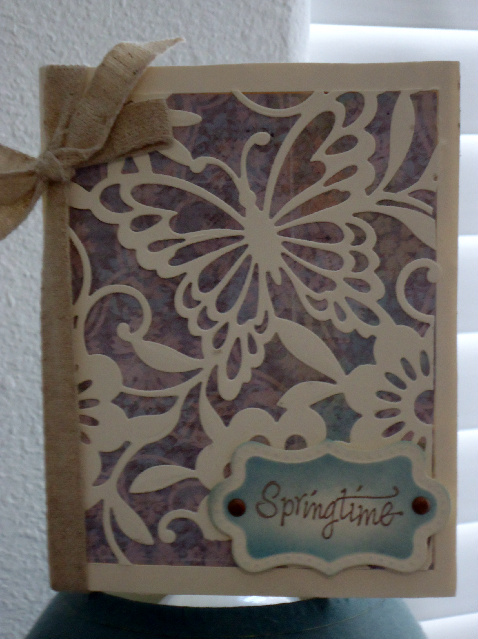 There are a lot of fun layers and stamping going on with this card so let's begin! 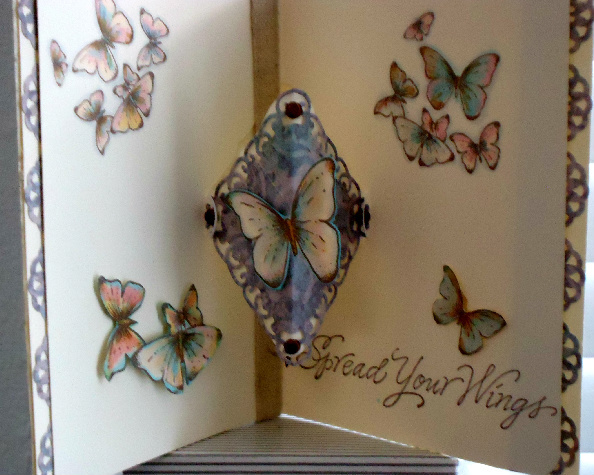 I think I'll start by showing you the inside of my card first - as that is featuring these wonderful Large and Small Trailing Butterflies stamps from The Rubber Cafe'. The inside is layered with a center card piece cut slightly shorter at 8" so when folded it is 4" by 5 1/2" and allowing for the pop-up in the center to set easily inside another card piece cut at 8 1/2" by 5 1/2" folding to a usual A2 card size. I did this as it is hard to get the two pieces when layered to match at the outer the edges. This also provided me with an opportunity to decorate that inside edge which I did by punching a pretty lacey edge from the same paper using a border punch which I nestled in between the layers finishing it off nicely! I stamped butterflies directly to the card surface as well as prepared some extras that I colored and fussy cut to pop up and also one for my pop-up section. To create my pop-up portion, I used my Spellbinder Label One die, and turning it 45 degrees - so I would have the points anchored to the card, I cut it on the fold of the inside card piece. I postioned my top cutting plate so that it was NOT on the out point edge which left that area un-cut and leaving me a piece that was cut all around except for that small area. To pop- I simply inverted the fold so it was a mountain fold instead of the valley fold of the card. 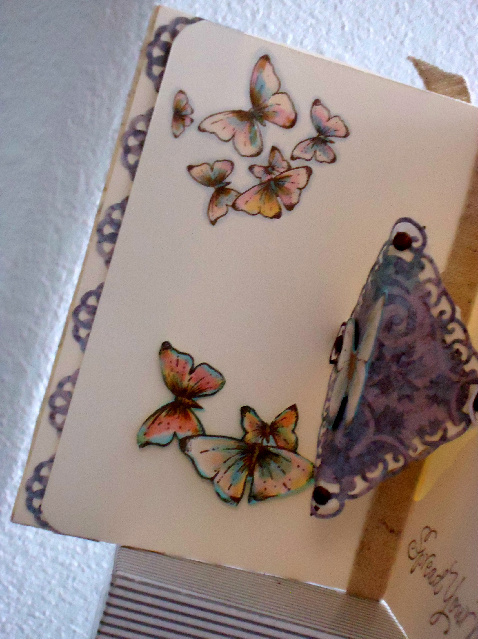 From my patterned paper, and using the coordinating Spellbinder Decorative Label One die, I cut a piece to layer on top and attached with brads to give it free movement when closing. As you can see I also added a larger butterfly to this piece to complete the center. 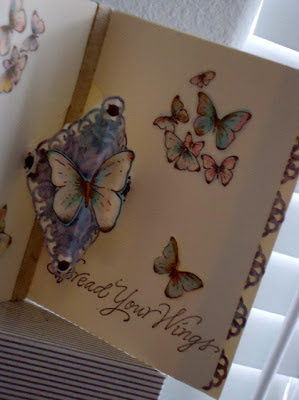 For my inside sentiment, I stamped the phrase, "Spread your Wings" which I think fit perfectly with this card. 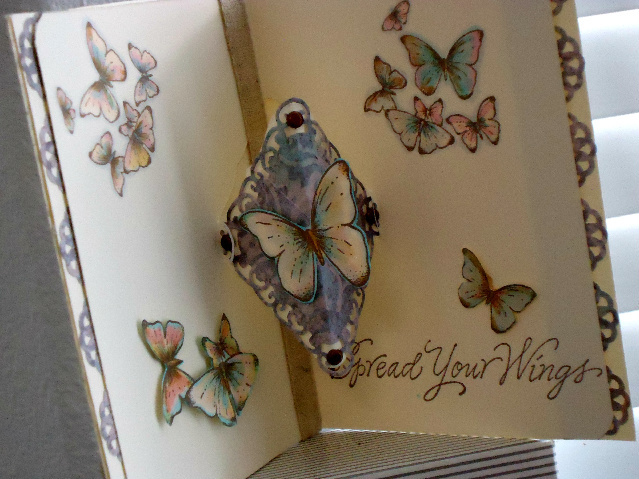 For the front of my card not to be outdone by the inside - I started by diecutting a piece using Spellbinders' Butterfly Magic die, it's an all-over die cut that fit perfectly for the front of my A2 card size. (I purchased this in The Rubber Cafe' - but I see now we do not have them in stock right now). I framed it in over the same patterned paper I used inside, and using another Spellbinder Tag die, stamped the word 'Springtime' and anchored it with brads in the lower RH corner. Some rustic twill ribbon was tied around the center card into a bow on the upper front to finish it off. Thanks for stopping by! I hoped you enjoyed my touch of spring today. Beautiful! The design is so fun! And the colors on those butterflies are fabulous! Just gorgeous....I'm ready for spring! Ohhhh WOW! What an awesome card! Fabulous 3D butterflies inside!